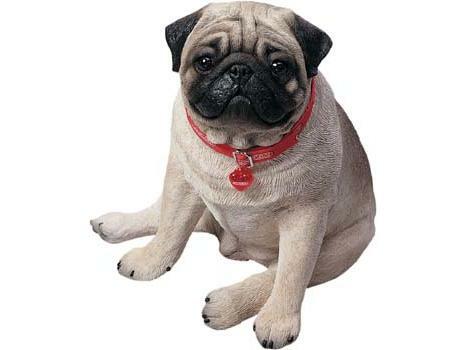 Pug, Fawn Sitting - Life Size: 12 inches long, 11 inches wide, 14 inches tall. The inner spirit and beauty of each animal is magnificently captured by Sandra Brue. Then, a mold is made of her sculpture, which Sandicast uses to hand-cast each piece, and the sculptures are then individually hand-painted. Due to the weight of this item, free shipping applies to the 48 states only. Buy this item and earn 170 points valued at $8.50. Related Products by Manufacturer: Sandicast, Inc.